CUERNAVACA, Mexico: Authorities in central Mexico are investigating whether forensic services officials illegally transferred more than 100 bodies of crime victims from morgues to two mass graves, prosecutors said Friday. The Morelos state prosecutor’s office launched an investigation following the release of a video showing forensic officials in white protective suits exhuming bodies in the village of Tetelcingo. The video was recorded in December 2014 by a murder victim’s family, which had sought the exhumation of his body. The corpse was among the bodies buried in the two pits in 2013. “We will review whether (the forensic officials) acted within the protocols required by law,” Morelos chief prosecutor Javier Perez told reporters. He did not say how many current and former officials are under investigation. The bodies had not been all identified and had been kept in morgues of the prosecutor’s office, he said. While the forensic services can bury bodies in common graves, there are a series of legal, health and administrative procedures to follow, Perez said. “Unfortunately, the forensic services of the prosecutor’s office do not have a big enough area” to hold many bodies, he said. Perez told Milenio television that there were “more or less 105 bodies” in the common graves and that they were linked to various criminal investigations. The state’s human rights commission, which began its own investigation in Tetelcingo on Friday, said more than 140 bodies were dumped in the pits. Fabiola Colin, the commission’s executive secretary, said the improvised cemetery was in the property of a private citizen and that the site did not have the proper permits. The commission may ask for the pits to be opened again to exhume all the bodies. The site of the graves is now a grassy field. The family of Oliver Wenceslao Rodriguez, which made the video, said it had counted 150 bodies. Rodriguez’s family demanded that his body be exhumed after his relatives conducted their own investigation to find him. Morelos has been one of the Mexican states most affected by drug violence plaguing the country, including kidnappings and murders. More than 100,000 people have been killed or gone missing in a nearly a decade of drug violence nationwide. Rodriguez was kidnapped in May 2013 and his body was found 10 days later in a ravine. The family recorded the exhumation despite the opposition of the authorities. The relatives said they counted 150 bodies wrapped in plastic and most lacked a file number that authorities must place with corpses to track their cases. The video shows officials putting the other bodies back in the pits afterward. 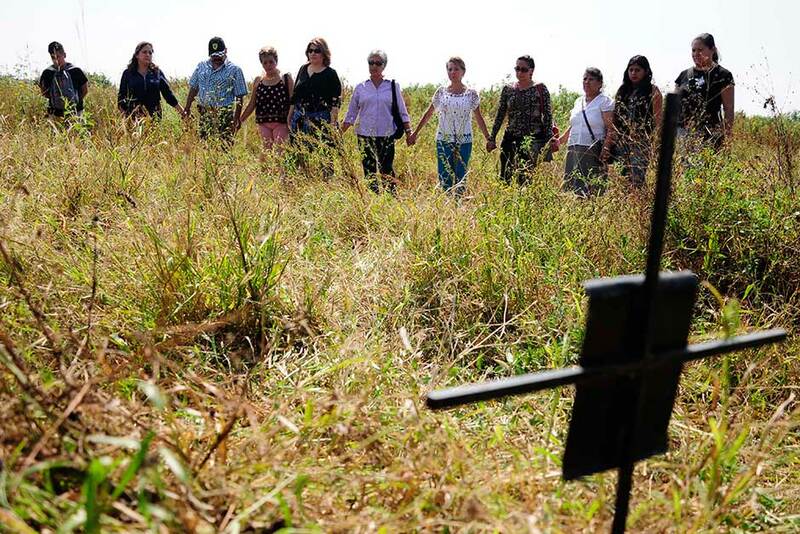 His family and relatives of other missing people visited the site again on Friday, holding hands and praying where the bodies were buried. “This can’t stay like this. Families want to know what happened to these bodies,” said Amalia Hernandez, Rodriguez’s aunt.